Town in Prussian Silesia, with 1,463 inhabitants; founded Jan. 20, 1663. In that year the Austrian emperor Leopold I., desiring to reward the Silesian chancellor, Baron von Dyhern, gave his estate Przig the rights and status of a city with the name "Dyhernfurth." To further the prosperity of his city its owner obtained permission (July 12, 1667) to establish a printinghouse, which, however, soon ceased to exist. In 1688, under Baron von Glaubitz, the new lord of the estate and of the city, the workers whom the printer Shabbethai BASS had gathered about him became a community—the first in Silesia since the expulsion of the Jews from that province in 1584. 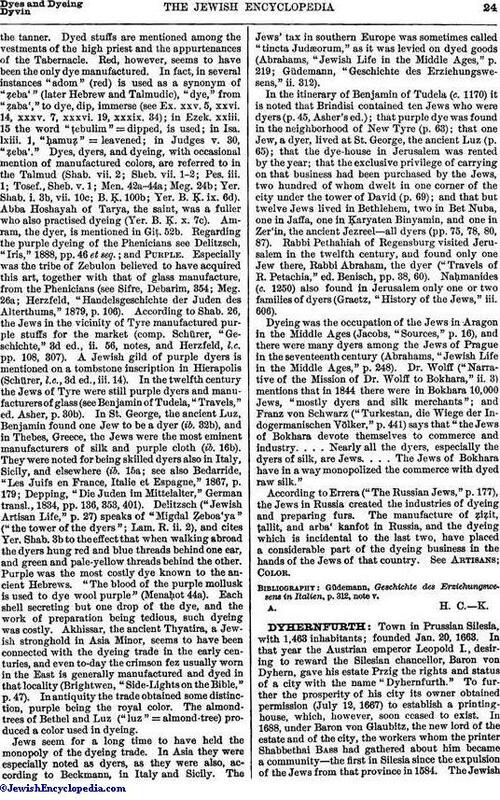 The Jewishcemetery established by Bass in 1689 has twice been enlarged (1805 and 1881) by purchase. Until 1761 the Jews of Breslau buried their dead in the Dyhernfurth cemetery. A synagogue had been established and maintained by Feibl Pesong, its president; in 1785 it was succeeded by a new temple, which was superseded in 1851. Among the rabbis who served the community of Dyhernfurth were: Wolf Katz ( = Kohen Ẓedeḳ) Schotten, who founded its ḥebra ḳaddisha; Rabbi Jacob Löb Falk, later dayyan in Breslau; and Ḥayyim Kroner. A branch community existed formerly in the neighboring town of Auras. The community of Dyhernfurth has steadily diminished, numbering at present only nineteen; its president is M. B. Weinbaum. Statistisches Jahrbuch des Deutsch-Israelit. Gemeindebundes, 1901. The earliest Hebrew printing-office in Dyhernfurth was established in 1681 by the bibliographer Shabbethai ben Joseph Bass. The place was well fitted for such an enterprise. Eastern Europe was the best market for Hebrew books, and, outside Prague, had no Hebrew printing-office at that time. A further point in its favor was the fact that the books supplied by Holland were very expensive. The first work to be issued from the presses of Dyhernfurth was Samuel ben Uri's "Bet Shemuel," on the Shulḥan 'Aruk, Eben ha-'Ezer (1689). In the same year appeared David ha-Levi's commentary on Rashi to the Pentateuch; three prayers to be recited in the cemeteries (with a Judæo-German translation by Eliezer Liebermann); and the mystic prayers of Nathan Nata' ben Moses of Hanover. In 1708 the establishment was partly destroyed by fire. It was, however, soon rebuilt, and in 1712 Shabbethai transferred it to his son Joseph, whose name appeared on the title-pages, together with that of his father, after 1707. During his last ten years of active work, Shabbethai confined himself chiefly to liturgical productions. In these years he issued four editions of the Pentateuch; a Judæo-German edition, by Ḥayyim ben Nathan, of the historical parts of the Bible; four editions of the Psalms; seven of the Siddur; four of the Maḥzor; five of the Seliḥot; and two of the Tiḳḳum recited on the nights of Shabu'ot and Hosh'ana Rabba. About this time Joseph, with his father, was accused by the Jesuits of circulating a book containing blasphemies against Christianity. They were imprisoned, and business was practically suspended. The subject of the accusation was the "Sha'are Ẓiyyon" of Nathan of Hanover, published at Dyhernfurth in 1705. No works published by the Bass firm from 1714 to 1718 are known to be extant. In the latter year business seems to have been resumed by Berl Nathan of Krotoschin, husband of Shabbethai's granddaughter Esther. Berl Nathan paid 5,000 thalers, purchase-money. After Nathan's death in 1729, it was carried on by his widow. About 1780 Jehiel Michael May from Breslau established another printing-office, which, after his death in 1790, was managed at first by his widow Rachel, and his sons Michael, Simon, Aron, and Joseph, but later by Joseph alone. In recent times a printing-office was established in Dyhernfurth by Warschauer & Co. 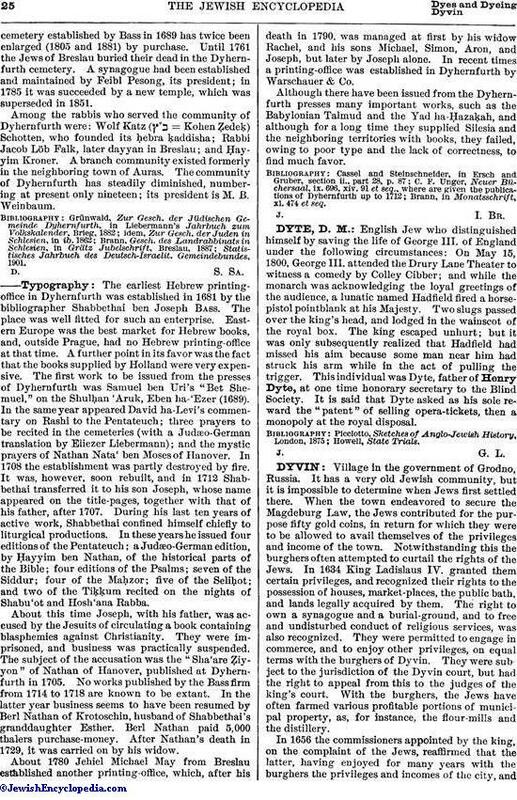 Although there have been issued from the Dyhernfurth presses many important works, such as the Babylonian Talmud and the Yad ha-Ḥazaḳah, and although for a long time they supplied Silesia and the neighboring territories with books, they failed, owing to poor type and the lack of correctness, to find much favor. Brann, in Monatsschrift, xl. 474 et seq.